To celebrate National Bike Week, which encourages “everyday cycling for everyone”, AnOther takes a closer look at the mesmerising photography blog dedicated to movie stars and their self-propelled vehicles, Rides A Bike, also featured on the AnOther Reader. Founded by Steven Rea, a film critic for The Philadelphia Inquirer, he explains: “Movies have been a love of mine all my life. And I’m also an avid cyclist – I’ve been riding, too, since I was a boy. So it’s the convergence of these two big passions!” Scouring various antique stores, junkyards and visiting numerous Hollywood memorabilia dealers, Rea unearths the most incredible finds, which he then uploads to his blog (now also available in the print publication Hollywood Rides A Bike). 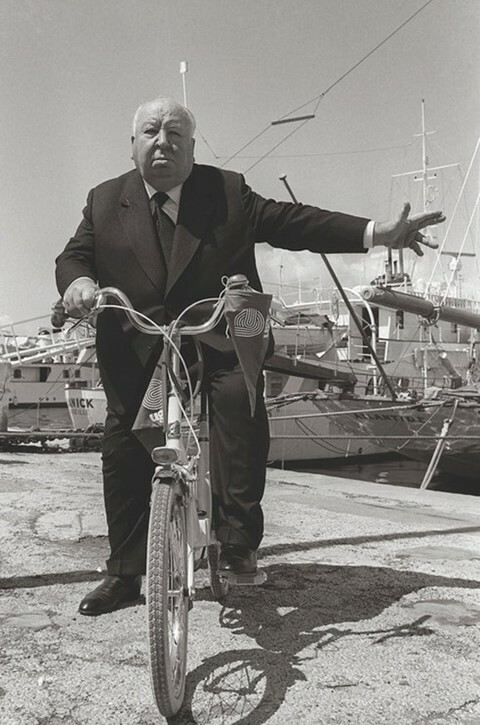 From Alfred Hitchcock precariously riding a bike along the harbour in Cannes, 1972, to Glenn Ford and Rita Hayworth in The Lady in Question, 1940 on a tandem – the Rides A Bike archive offers a rich diversity of some of the world’s most famous film icons and their vintage bicycles. When did you start Rides A Bike? I launched the blog on Tumblr on Thanksgiving Day, 2010. By the end of that first holiday weekend, I had literally thousands of Facebook likes and lots of encouraging emails from folks far and wide. How do you go about sourcing your images? There are dealers on the web who specialise in Hollywood memorabilia, and also several stores. Jerry Ohlinger’s Movie Memorabilia in New York has been one such source, and the great folks who work there are now on the lookout for me. I’ve also found images in antique shops/junk shops/street sales in Brooklyn and Los Angeles, and now fans of the website and the book are sending images too. And I’ve heard too, from a few children of old Hollywood stars – Glenn Ford and Eleanor Powell’s son, Peter Ford, gave me a beautiful shot of his mother riding a bike in Beverly Hills. How selective are you about the images you choose to post? I look at the bike, the star(s), the setting, the scene. I’m also drawn more to vintage photos, and images of stars of bygone days, rather than shots of, say, Natalie Portman or Brad Pitt on a bike. For me, there’s more glamour and style to be found in the older shots, and of course movie history, too. "There’s more glamour and style to be found in the older shots, and of course movie history"
Do you have favourite photo? I have a number of favourites – if I had to pick one it would be the shot of Susan Peters, on a bike, on the Pacific Palisades in Santa Monica, looking out to the sea. It’s a gorgeous photo – she’s lovely, so is the Monarch bike she’s on – but then when you hear her story the photo takes on another, sadder, richer dimension. Peters was an Oscar-nominated young actress, being groomed for stardom at MGM, when she was shot in a hunting accident and left paralysed from the waist down. She tried to continue her career in a wheelchair, but things fell apart: her husband (Richard Quine, the actor and director) left her, she became anorexic, and died of kidney failure at age 31. This photo came to me from another collector and bike aficionado, Howie Cohen, whose website is a trove of cycling history. 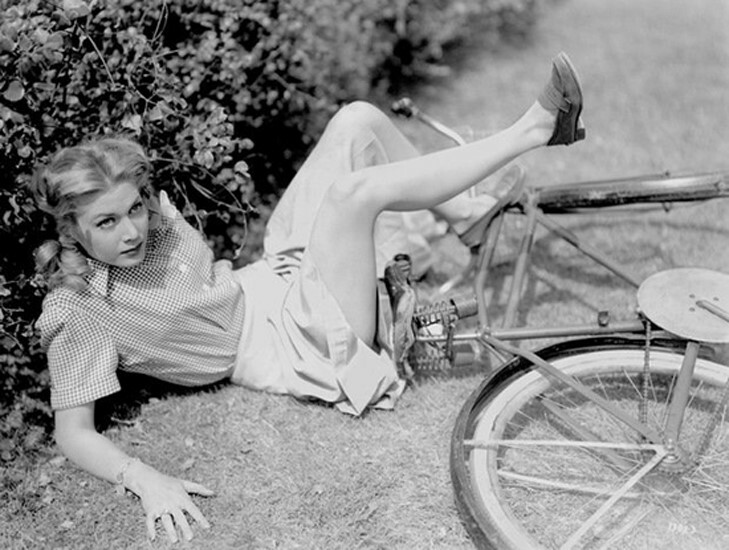 Which movie stars are your favourite bike riding icons and why? Humphrey Bogart for his implacable cool; Paul Newman for his fearless stunts (see Butch Cassidy and the Sundance Kid); Katharine Hepburn for riding a bike all through her career, from her ingénue days in Hollywood to her retirement in Connecticut (I have images of her on a bike at every stage of her career, I think), and W.C. Fields, for his improbable balance and grace. Focusing on vintage Hollywood icons – what are the main differences in how we used to ride bikes then and now? No worries about helmets, no need to suit up in Lycra and Tour de France gear. 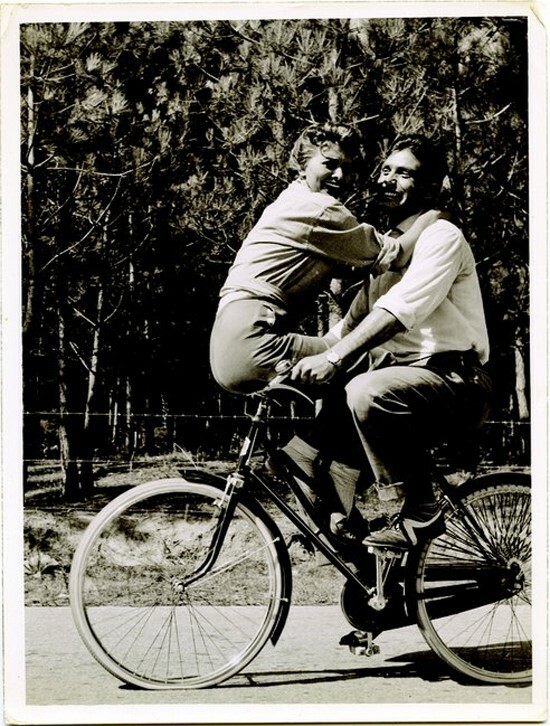 The bike was simply a fun, convenient, liberating means of getting around. People are beginning to recognise these simple pleasures about the bike again now, which, I believe, is one reason why the Rides a Bike images and Hollywood Rides a Bike book have been so enthusiastically received. "I ride every day, to and from work, and all around town, and then try to take longer recreational rides once or twice a week"
Are you a bike-riding enthusiast – please tell me a bit about your bike riding and what bike you own? I ride every day, to and from work, and all around town, and then try to take longer (20-50 miles) recreational rides once or twice a week. My wife and I own 14 bikes (I think), including a few gorgeous mid-century British lightweights and club bikes (a Bates, a Mercian, a Rudge, two Raleigh Lenton Grand Prixs), and also a Peugeot mixte from the 60s, a Brompton, a Frejus woman’s model from the 60s, an American coaster-brake cruiser and a Raleigh DL-1 rod-brake bike (the “postman’s bike”). The latter is my every day bike. Do you have any bicycle models on your “wish list”? Too many! I love the Rene Herse vintage radonneurs, and there are a number of artisan built British bikes of days-gone-by that I would love to have: Ephgrave and Hetchins, in particular. And there are a number of modern-day hand-built bikes from great frame builders: Rivendell, Bilenky, Hanford. What is your favourite bike route? I do a group ride once a year that goes from New Hope, Penn., to Brooklyn, in New York, starting out in farm country, turning gradually more suburban and then very, very urban. 100 miles all together, full of surprises. Having created a blog of incredibly glamorous bike riders, what would your top three tips for looking stylish whilst riding be? 1. Wear what you’d wear if you were going for a walk or meeting friends for lunch. Be a “citizen cyclist,” not a competitive commuter. 2. Find a bike that suits you both physically and aesthetically. 3. Fenders (mud guards) a must! Who wants a splatter of street-sludge up their back, especially if you’re wearing a nice suit, dress, or even jeans and a T-shirt? What do you hope viewers get from your blog? Enjoyment, a smile on their face, inspiration to get on a bike and ride, and also perhaps go back and watch some very cool old films! Hollywood Rides A Bike by Steven Rea is published by Angel City Press and available here.